Reference: Rosengren A, Hauptman PJ, Lappas G, Olsson L, Wilhelmsen L, Swedberg K. Big men and atrial fibrillation: Effects of body size. Eur Heart J. 2009 May;30(9):1113-20. This Swedish study followed 6903 men (mean age 51.5 years) for a maximum of 34.3 years for the development of Atrial Fibrillation (A. Fib). A. Fib. developed in 1,253 (18.2%). Larger body surface area (BSA) - reflecting weight and height - at age 20 correlated strongly with subsequent risk of A. Fib. (p < 0.0001). Body mass index (BMI) at midlife and weight gain from age 20 to midlife also correlated strongly (p < 0.0001). Regression found that large size at age 20 and weight gain between age 20 and midlife were independent risk factors for the development of A. Fib which were associated with a graded increased risk in A. Fib. to more than a two-fold increase. A discussion on heart.org (theheart.org/article/961447.do) points out that these data were generated in a time and place where obesity was much less common than is currently the case in the U.S. Because of the recent increase in the level of obesity; it is likely that the incidence of A. Fib. will continue to increase well above the 18.2 % incidence as reported in this trial. 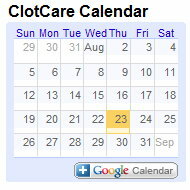 These findings appear to be consistent with others posted on ClotCare at clotcare.org/clotcare/atrialfibrillationincreasing.aspx which suggested that the prevalence of atrial fibrillation in the U.S. may be more than 5 million people and increasing.